For more pictures from this trip, go here. Top of the agenda when our American friend Nancy came to stay in late May was a visit to Scotland. But first we had to see more of Yorkshire. After a very early start via Manchester airport we spent the first afternoon in the Nidderdale Museum in Pateley Bridge. Don’t miss this if you are ever in the area. It’s a wonderful example of what you can do with lots of enthusiasm and very little money. We went to York on a not so nice day, and visited the Minster where they were getting ready for the Mystery Plays (don’t miss this either but it’s only every 4 years) and the Richard III Experience. We had tea at Bettys and saw The Merry Wives of Windsor at York Theatre Royal. We took in plenty of castles during Nancy’s visit. Another day we took a drive from home round Wensleydale via Middleham Castle, then on to Wensleydale Creamery (of the cheese, but they do have good ice cream too), over the top to Wharfedale and finishing with dinner at Linton near Grassington. We began the next day at Helmsley Castle on the edge of the North York Moors. 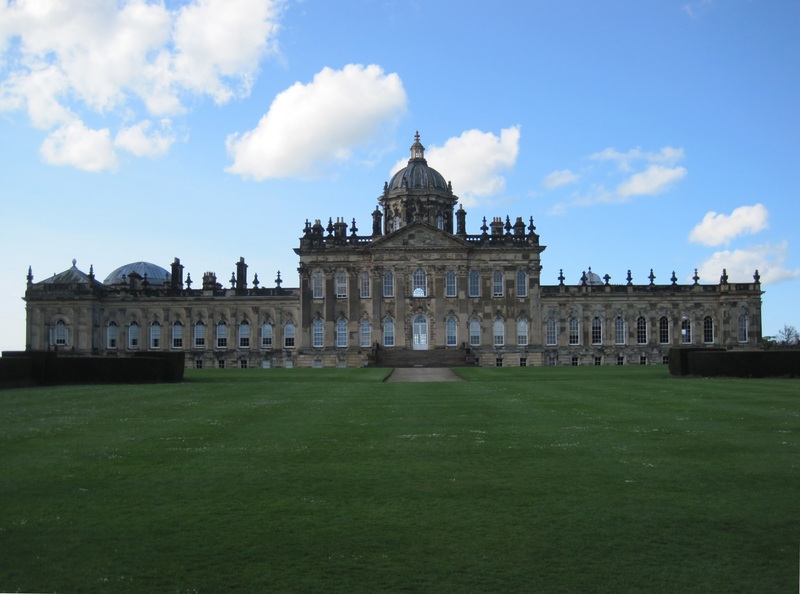 I finally dug out my camera when we went on to Castle Howard (definitely a place for Brideshead aficionados), then looked at the Anglo-Saxon Church at Kirkdale and had dinner at the Lion Inn on the top of the North York Moors. And we visited our local castle at Ripley. Hadrian’s Wall was also on the agenda. After a stop at the 7th century Anglo-Saxon Church at Escomb we braved the cold wind to climb up to the Housesteads Roman Fort. Then the rain came for almost 24 hours. This didn’t stop us going to Holy Island, but it was too wet to do anything except tour the castle. Would the Scottish Weather be Kind to Us? I had been put off Scotland by my first visit years ago when it poured down and even snowed in Edinburgh in March. After the rain on the way there in Northumberland, had we made a mistake in attempting to show off this part of the UK to a visitor from New York where it’s always fine, warm and sunny in May? 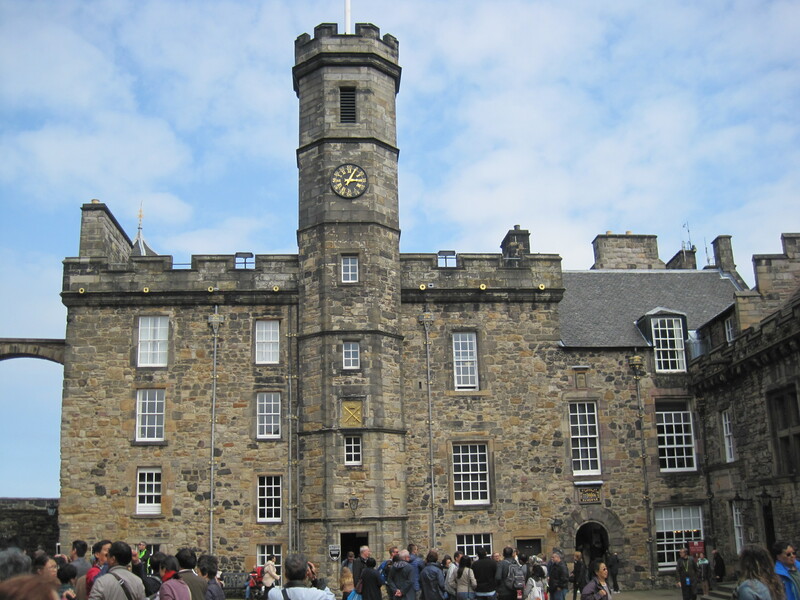 Edinburgh was a must for Scotland but accommodation was in very short supply. 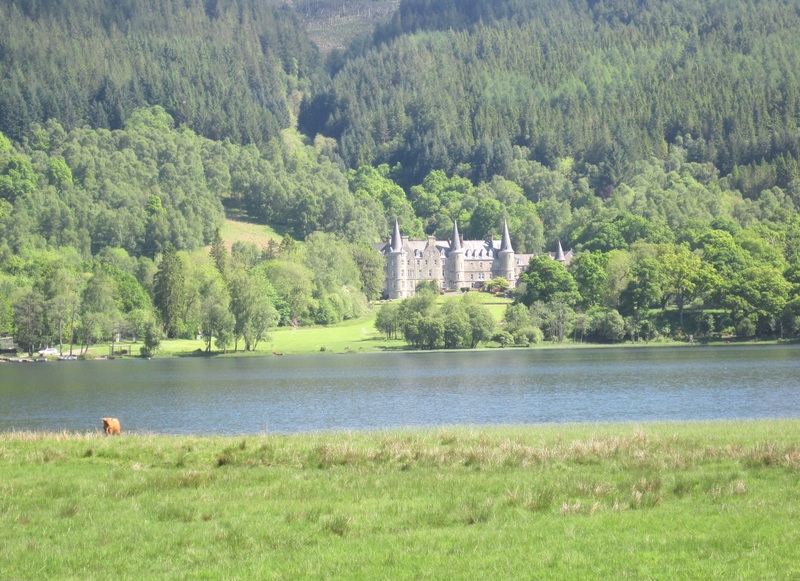 Suddenly I thought of the Holiday Property Bond place Tigh Mor in the Trossachs, looked at the map and realised we could get to Edinburgh in just over an hour from there. Miraculously they had one 2-bed apartment which we grabbed online. 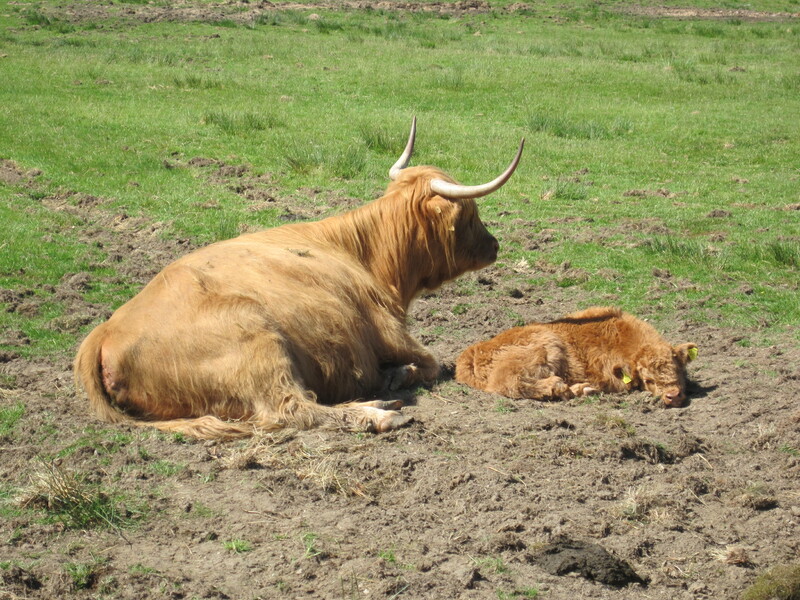 Tigh Mor is in a lovely setting and there was a lot to see close by like these neighbouring inhabitants. There were plenty of these around. The sun came out as we arrived on the Thursday evening. 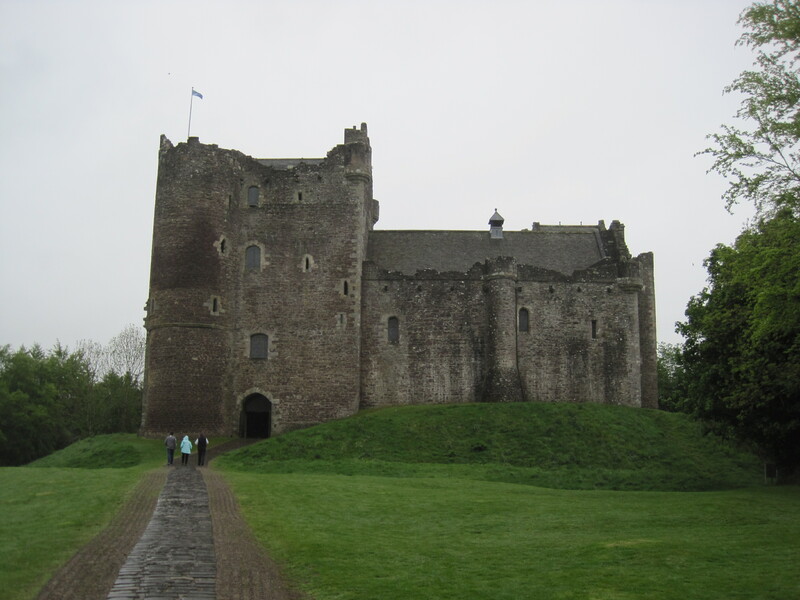 It rained again on the next morning when we went to Doune Castle – well remembered by addicts of Monty Python and the Holy Grail – but then the sun really started to shine after lunch. The next castle was Stirling which I liked the best. There are some wonderful wall and ceiling paintings and the life-size models showing what life was like in the kitchens are very realistic. I began to realise how little I knew about Scottish history. We were advised that Edinburgh was best tackled via the park and ride tram which was quite quick but meant a walk uphill from Princes Street. We started at the National Museum of Scotland with the special exhibition on the Celts (well worth seeing) and then joined the huge throngs visiting the castle. There is really too much there. I liked the stained glass in the small St Margaret’s Chapel but I didn’t fancy a stay in the underground prison area. The dog cemetery was a nice human touch, but it was all very crowded. After the castle we walked down the Royal Mile and inspected the outside of the futuristic Scottish Parliament building, then took a rather slow bus ride back to the park and ride and had a nice Mediterranean dinner in Stirling on the way back to Tigh Mor. On another sunny day we took a drive round the Highlands with a stop by the Fortingall Yew tree, which is thought to be about 3000 years old, and had a nice lunch outdoors in Aberfeldy. 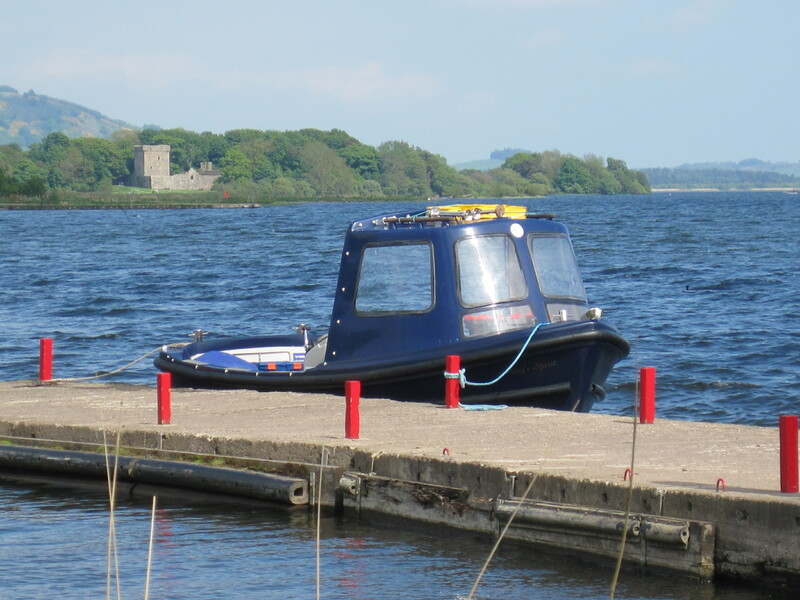 Our main destination that day was Loch Leven Castle which is on an island in the middle of the loch. We had to take the “wee boat” to get there. We were the last people of the day and the “wee boat” made a special trip to fetch us back. Then it was on to the Antonine Wall which was the northernmost frontier of the Roman Empire. The sights included a tourist notice in Latin, a few humps on the ground at Rough Castle and a herd of curious cows in the next field. Our own curiosity led us to have a look at Andy Murray’s Cromlix House Hotel just north of Dunblane on the way back. More curiosity led us inside where we ended up having the most elegant fish chips I have ever eaten, in a very elegant lounge. Nancy left next day and so after an early start to Edinburgh airport (which has the most expensive airport parking I have ever come across), we crossed the Forth Bridge and drove west to Culross which is an important pilgrimage for historians of digital humanities. The Rev Andrew Q Morton lived in the Abbey Manse for many years and it was there that he worked on his computer-based analyses of St Paul’s Epistles in the 1960s. It was reading about his work that first got me interested in computing for the humanities. In the Abbey Manse tea shop we met some Americans who knew Andrew and learned that there were people in Culross who remembered him. Anecdotes about him abound, but the one I remember best is his response when he was asked what visual aids he needed for a conference talk. His answer: “A single piece of chalk”. It was hot and sunny again as we walked round Culross. 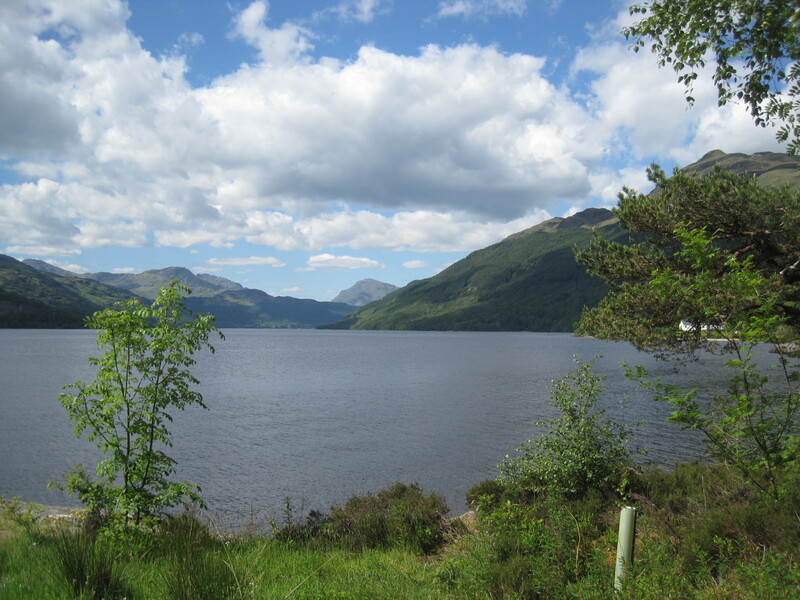 For our last day at Tigh Mor we took a trip to the Bonnie Banks of Loch Lomond. The northern part of the east side around Inversnaid was relatively quiet except for all the people trudging along the West Highland Way. We did a short hike to lovely view but didn’t stay too long at the southern end which was very crowded. The sun continued to shine, mostly. The weather was so nice that we decided to stay another three days in Scotland. Neither of us had ever been to Mull and so we booked place to stay for 2 nights at Pennyghael. We eschewed the main ferry from Oban, instead driving through Glencoe and taking the smaller boat from Lochaline to Fishnish. There’s no need to book. You just turn up and we were on the boat within 30 minutes for the short crossing. We spent the rest of the day driving round the southern part of Mull. 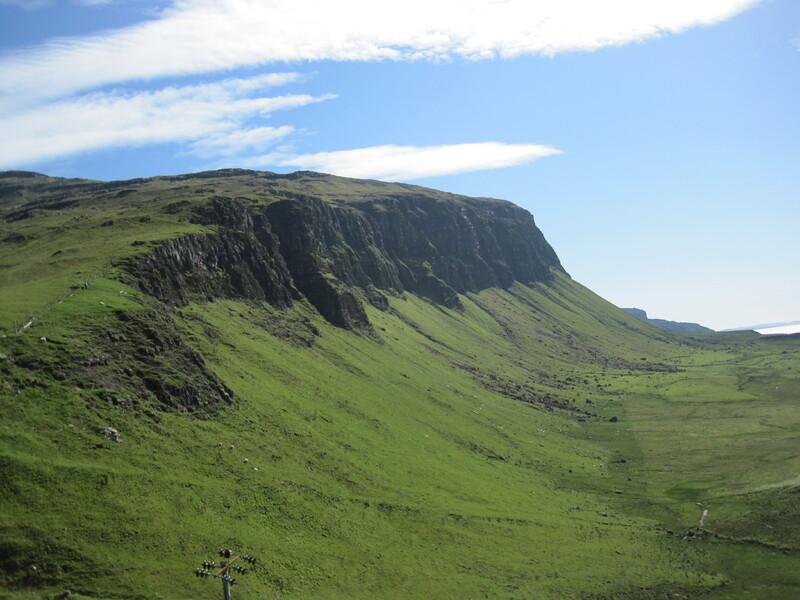 It was more mountainous than I expected and there were some spectacular views across to Staffa. Sea eagles were rumoured to be present in the mountains and plenty of people with large telescopes were definitely present. It was warm enough to have a drink outside before dinner. 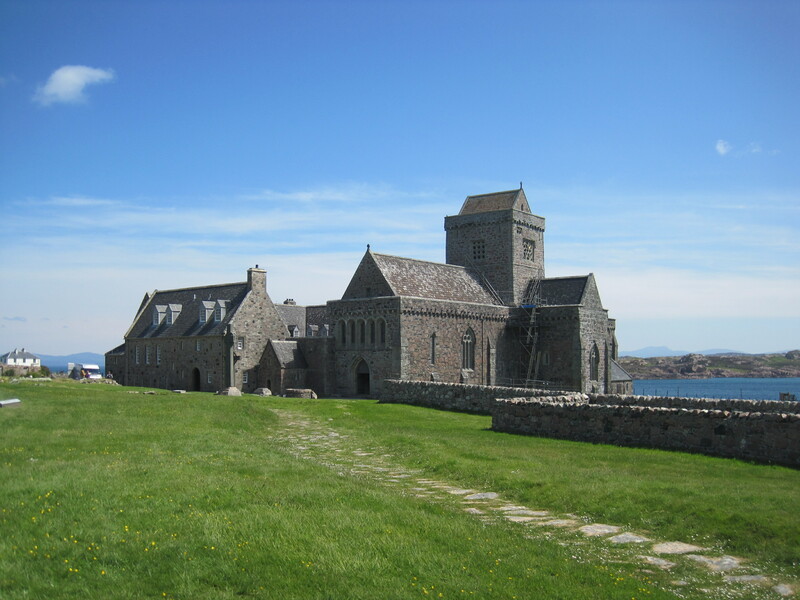 On the next day we took the short ferry crossing to Iona and walked to the Abbey which is in a lovely setting. I particularly liked the Celtic crosses which we had learned all about at the exhibition in Edinburgh. 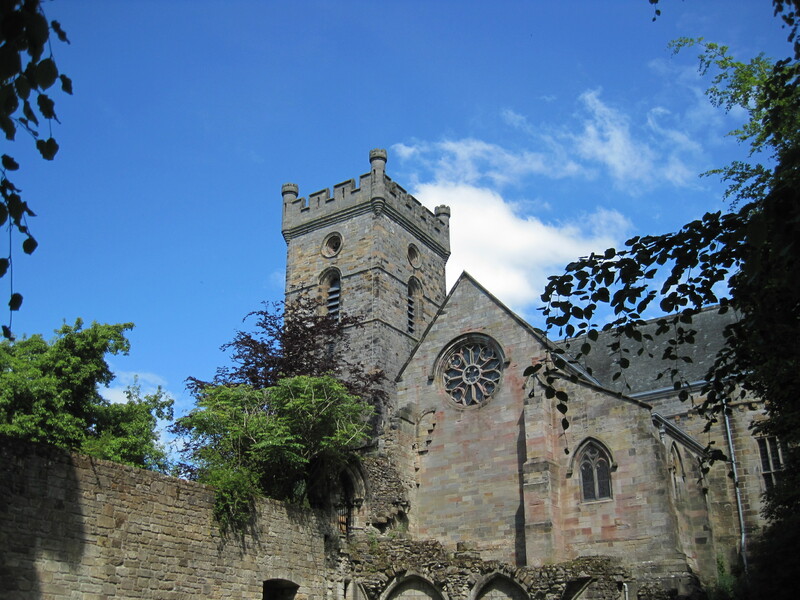 The Abbey was founded by St Columba who came from Ireland in the 6th century AD. It also has an important burial ground for many Scottish kings including Macbeth, as well as the Labour leader John Smith. In spite of all the visitors, I really got a sense of tranquillity there. On the way back to Pennyghael we had a quick stop at the Isle of Mull Weavers at Ardalanish where they use Victorian looms to make a variety of products. It was almost closing time but one of the ladies there stayed behind to explain the whole process to us – without the noise of the looms working. I bought some wool for a hat. It is still waiting to be knitted up. The hotel at Pennyghael was full for the next night, as the rest of Mull also appeared to be, according to our online searches. 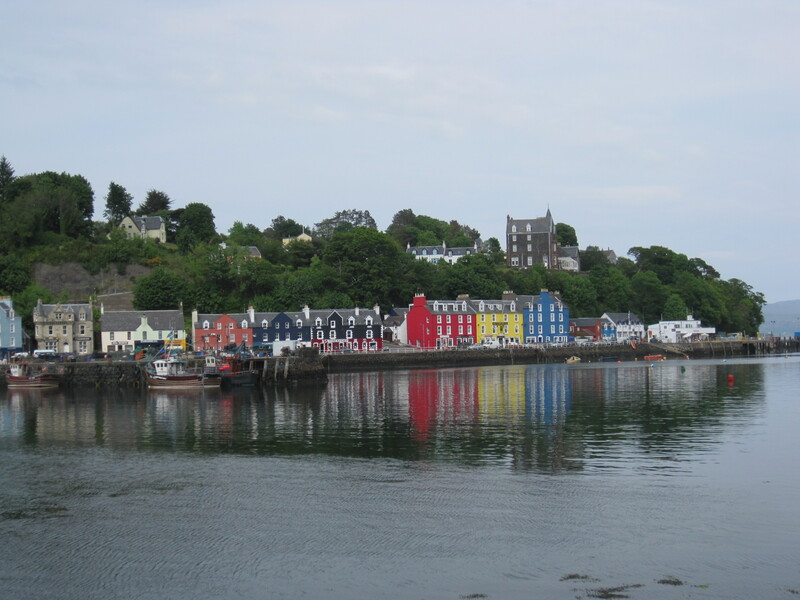 We decided to try our luck in the largest town Tobermory with its pretty coloured houses by the water. The person in the visitor centre at Tobermory suggested the Ariundle Centre on the mainland. We phoned there and were able to book a room. With that worry out of the way we drove round more of the north of Mull visiting the original Calgary which is a beautiful beach whose name is Cala Ghearraidh in Gaelic, meaning Beach of the Meadow. We took the other short ferry crossing from Tobermory to Kilchoan on the mainland. He who likes to go to the end of everywhere couldn’t miss Ardnamurchan Point and so we diverted to this westermost point on the British mainland. It was still sunny and we could clearly see across to Skye. It was getting late when we turned up at Ariundle to find that it was not quite what we were expecting. What to do on a Saturday evening at 7pm? The Rough Guide came to our rescue with its recommendation of the Glenuig Inn on the Sound of Arisaig. They said they could offer us beds in the bunkhouse which had no other occupants. It turned out to be a 5-star bunkhouse room with 9 real beds (no bunks) with beautiful matching linen, spotless bathrooms and kitchen. 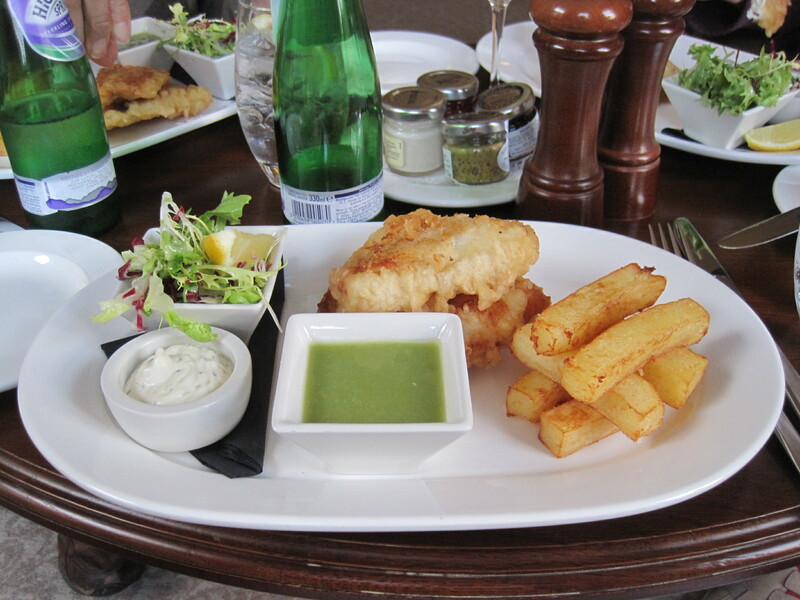 The bar food reflected the hotel’s green credentials and both dinner and breakfast made a change from the standard B&B fare. It was still sunny when we drove home through Glencoe, Glasgow and Penrith, a drive only marred by listening to Andy Murray’s defeat by Novak Djokovic in the French Open Final. 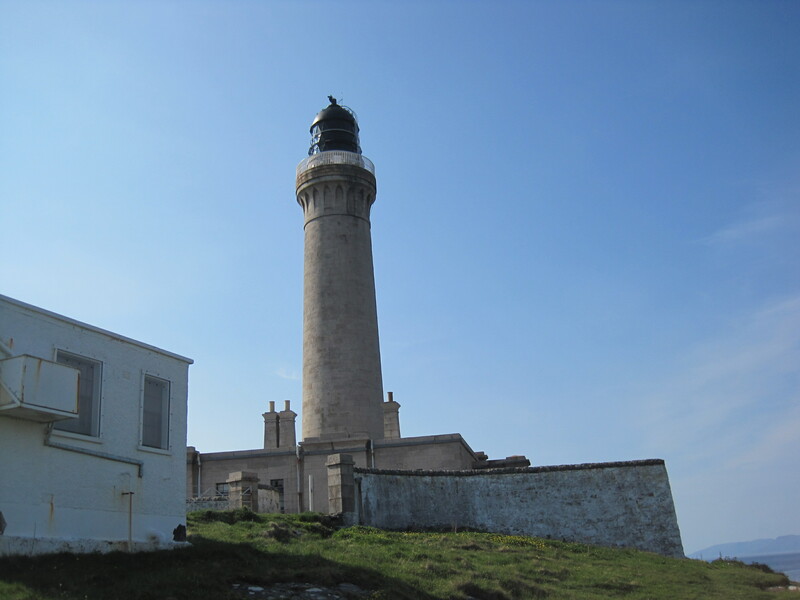 This entry was posted in Uncategorized and tagged A Q Morton, castles, HPB, Mull, Scotland, Tigh Mor. Bookmark the permalink.